Frame #1: The left arm has just commenced the extension phase of propulsion while the right arm has broken the surface on entry. The left arm is well under the body. The head is turning to the left to breathe. Frame #2: The right arm commences to press down and bend at the elbow while medial rotation of the upper arm begins. The left arm begins to "round out." The head is turned fully to the left. The left leg trails loosely. Frame #3: The right arm begins to rotate to apply force primarily in a backward direction. The right upper arm is still extended well forward contributing to an "elbow-up" position. Inhalation occurs as the left arm recovery commences. The left leg begins to kick to balance the right arm. The size of this kick is not particularly large because the degree of vertical force involved in the early part of the right arm pull is not great. Frame #4: Rapid adduction of the right upper arm occurs and propulsion is primarily backward. The left leg kicks and counter-balances the right arm. Inhalation is close to completion. The right leg rises to the surface preparatory to kicking. The shoulders are rotated fully at this stage. Frame #5: Left arm propulsion continues with adduction continuing to exploit the hand/forearm propulsive surface. The left leg kick is completed. The head begins to return. The left arm recovery is past vertical and the shoulders begin to rotate back toward a flat position. Frame #6: The middle of the right arm pull has been reached. The left arm approaches the water. The shoulders approach being flat. The head continues to return. Frame #7: The right arm extends rapidly backward and under the body while the fingers of the left hand break the water surface. The shoulders are flat. The head is almost fully returned. Frame #8: The right arm completes its propulsive phase and commences to "round out." The left arm has entered the water bent at the elbow and immediately begins to be repositioned to provide propulsion. Medial rotation of the upper arm (an "elbow-up" position) is clearly seen in this figure. 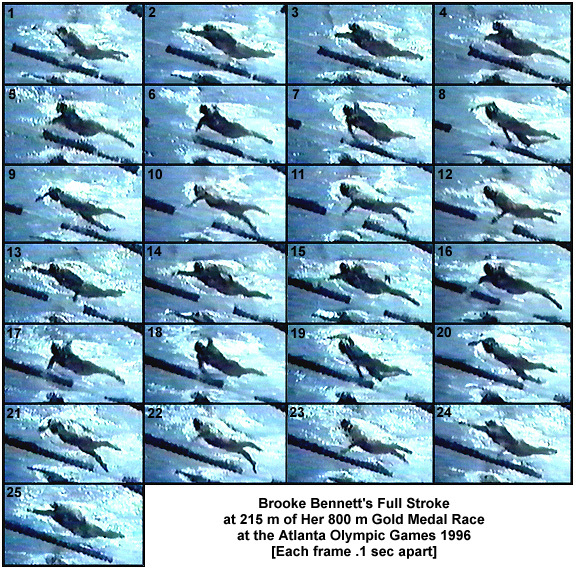 This position is typical of some of the great female distance swimmers (e.g., Jenny Turrell, Janet Evans). It demonstrates an almost continuous application of force. As one arm completes its propulsion, the other commences to propel. This form of stroking minimizes inertial lags and is particularly efficient for certain physiques and physiological attributes. The right leg begins to kick to counter balance the left arm. The shoulders have already rotated to the left. Frame #9: Adduction of the left arm occurs to assist in propulsion. The hand/forearm surface serves to provide propulsion. The right leg continues to kick. The right arm begins to exit the water. The head is well down in the water. Frame #10: The shoulders are almost fully rotated to the left, adduction of the upper arm is in mid-range of movement, and the right leg completes its kick. The left leg begins to rise toward the surface preparatory to kicking. Frame #11: The left arm is in mid-pull and at this stage the hand/forearm propulsive surface is perpendicular to the direction of swim. The shoulders are now fully rotated to the left. The head is well down which assists in streamlining of the torso and hips. The right leg rises. The recovering right arm is well past vertical. Frame #12: The shoulders are flattening rapidly as adduction of the left upper arm is completed and extension is phased in. The left hand and forearm are under the body. The head remains low with the hips high. Frame #13: This frame is mostly similar to frame #2 with the exception being that no breath, and consequently no head turn, will occur. The left arm completes propulsion as the right arm commences to develop propulsion, the characteristic of almost constant propulsion being demonstrated again. Frame #14: The right arm continues to develop propulsion as the left arm exits. The right arm is effective earlier in the stroking sequence, that is, while more of the left arm propulsion occurs, than in the breathing stroke. This suggests that the head turn and inhalation involved in breathing slightly delays the introduction of the right arm in developing propulsion. The left leg begins to kick to counter-balance the right arm. Frames #15 to #19: The sequence of actions is repeated as in frames #3 to #8 with the exception being that the right arm pull overlaps more of the left arm movement. Frames #20 to #24: The left arm pull duplicates much of the previous sequence of frames for the left arm pull. However, it appears there is slightly more length forward at entry and medial rotation is completed earlier coming off this non-breathing stroke as opposed to the previous sequence which was after a breathing stroke. Frame #25: The position of frame #2 is repeated. Brooke Bennett's stroke makes a lot of sense from a propulsive perspective. It is almost continual and sacrifices overall length forward but not effective propulsive length. It is a stroke that supports a high rate for there is little wasted movement caused by any unnecessary actions or exaggerations. The subtle change in stroke length of the left arm between breathing and non-breathing strokes is caused possibly by the rotating head and some hyper-extension at the neck both "shortening" the ability of the musculature to facilitate extension forward. When the head is well down in the water and aligned in streamline with the torso the ability to reach forward is improved. That seems to be the most obvious reason for this small, but important, deviation in stroke. The tempo of this stroke is such that there is only time to comfortably perform a two-beat kick. To attempt more kicks would be excessively fatiguing as well as require a slowing of the arm cycles so that sufficient time would be available to complete the extra kicks. It is reasonable to assume that if Brooke Bennett attempted to alter her arm-stroking tempo or her kicking that her stroke movements would be altered considerably. Any such changes most likely would not be beneficial.